Morris Farms Cypress Sawmill is located in Baxley in the heart of Southeast Georgia. The mill manufactures several siding patterns, wainscoting, paneling, fencing, decking, flooring, mouldings, shakes, shingles and lumber for other special purposes. Most of our products are custom made for customers who send in orders, and we often are called upon to do special cuts that are not available elsewhere, including materials for historic preservation. The mill has been in business since 1983 and concentrates almost exclusively in the production of cypress. 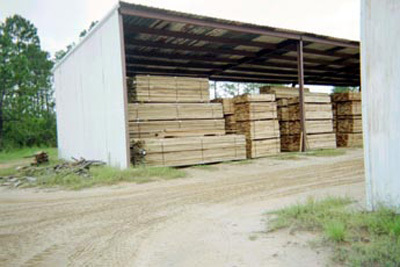 At Morris Farms Cypress Sawmill, quality and service can be expected. Material is checked prior to shipping to ensure the best possible lumber for our customers. These quality assurances will give the customer value for their money. Lead time for most orders generally range from two to four weeks. Customers may also request pre-staining all sides of their lumber to save time and money at the job site. Call, fax, e-mail or write for pricing or any other questions that you may have. Morris Farms Cypress Sawmill is dedicated to providing you, our customer, with expert knowledge to assist with your next building project.